We’ve been totally inspired by the Pop Ups new maker-themed album Appetite for Construction. If you’re little ones aren’t in school yet, you may not be familiar with the “maker” trend in bringing children into a wonderful world of creativity. Children as early as kindergarten are attending STEM classes. STEM is an acronym for Science, Technology, Engineering and Math. Children get to witness and participate in real world applications of these fields in age appropriate ways. I love that schools are focusing on making “making” fun! If you spend most of your time with the under 5 crowd this being a new focus may surprise you. Toddlers and even preschoolers are natural makers. They are prolific makers. Every waking moment is filled with discovering the way their world works. Our joy is in learning to be makers all over again by following their lead. That said, it is fun to introduce new concepts to them through various crafts and activities. In honor of The Pop Ups new album and one of my favorite songs “All These Shapes” I’ve collected 25 Crafts and Activities all about shapes and how your little one can be a maker using shapes. And a bonus song about shapes you can sing with your little ones. Elli loved this craft, too! We’ve been working on colors and chose this craft to work more on the color yellow. I drew a cityscape on a piece of blue construction paper. The Eiffel Tower just sort of happened. My favorite though was when Scott added a star to the top and showed me, calling it the Eiffel Tower. I didn’t know my heart would be so happy about him recognizing and loving this structure. Scott enjoyed gluing the star bits in the sky and then adding in the Duck tape stars. We had fun talking about the color yellow, gluing, and his strategies for where he placed the stars. He stuck with this Twinkle Twinkle Little Star craft for preschoolers longer than I had expected. He was also very excited to show it off to his dad when Brent got home. 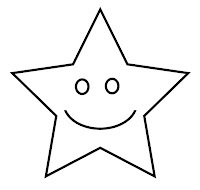 Looking for more Twinkle Twinkle Little Star crafts for preschoolers? Check out these Twinkle Twinkle Little Star crafts. Instagram is fast becoming my favorite place to find inspiration for my creativity. There are so many amazing bloggers sharing snippets of their easy kids crafts. And with hashtags like #kidscrafts and #rockinartmoms your creativity will be on an adrenaline high. In this month’s Growing Up magazine, I’ve gathered 9 spring/March crafts from some of my fave Instagrammers. Their blogs are beautiful and so are their Instagram accounts. I highly recommend checking them out and following along. Check out the crafts hand picked to make this month more special for you and your little ones. Issue 5 is on SALE until Sunday! Only 1.99 for the issue, or start your monthly subscription for just .99. Prices good through Sunday, March 23. While you’re there checking out the crafts, enter your email for 4 FREE songs. Who doesn’t love free music downloads, right? I am so lucky this year to be a home room mom, twice! Last week we had Elli’s Kindergarten class party. Lots of moms and grandmas showed up to help and enjoy the party with their little ones. Because I was so focused on that, I kinda neglected Sammi’s class. Her teacher didn’t want a party, just treat bags. So, just in time, I got a letter sent home inviting parents to send in candy and come help fill bags if they wanted. All that was left was to get the treat bags. Enter my talented mom! Color Heals Me is a new blog my mom just started to journal her adventures in art and art journaling. She is the doodle master! The girls and I have had so much fun learning to doodle with her. She recently created a Halloween doodle free printable. We used her doodle printable to decorate the treat bags for Sammi’s class. First I printed out her doodle page on different shaped label stickers. Then we each took a label sheet and colored in the doodles. Sammi and Elli used watercolors. I encouraged them to not use too much water so the colors would be vibrant and not spread. My favorite is colored pencils so that’s what I used to color my doodles. Once the paint was dry, I added the round stickers to the bags. I’ve had my labels for a few years (I bought a huge stack) and found they didn’t stick to the paper bag as well as I’d have liked. I wish I would have covered them with packing tape to make sure they stayed put. Sammi wrote the names of all her classmates on the bags. She loved the idea of each person knowing which bag was there and not fighting over which they thought looked the fullest. I’m so glad she’s thinking of these things and planning solutions for them. After the bags were filled, we used the rectangle labels to close them up. Turns out it’s okay they don’t stick that well, because Sammi’s teacher had more candy to add. This was a fun project to do with the girls and made for a quick but darling treat bag for the kids in Sammi’s class. Want to make your own? Or just have a fun Halloween coloring sheet? Download the free Halloween doodle printable and let the creative juices flow! What’s your favorite medium: paint, colored pencil, crayon, marker? What’s your child’s? We received a text from my mom one day that had this gorgeous painted rock. We were totally inspired! I ran out and bought a gold paint pen so we could get to work. Then came the treasure hunt for our rocks. We searched in our yard and came up empty. We went for a walk in the woods behind our house and didn’t find a single rock. On Labor Day we went to Natural Tunnel State Park in southwestern Virginia. After taking the chair lift down to see the tunnel, we hit the jackpot! There were so many fantastic rocks to choose from. We each chose a favorite, or two, to take home. We had a lovely crafting session on the front porch after school one day. We chatted about school, plans, and dreams while we painted our rocks. Then we arranged them in a lovely garden to see as we come and go from our home. Sammi love entertaining Ben and helping him discover the world around him. Only one day left! Happy Halloween, tomorrow. Just in case you are looking for some last minute ideas, here are some ways to celebrate with ordinary supplies you probably already have on hand. We drew our pumpkins and the background with pencil. Then we mixed the black into the food coloring into the glue. We painted the lines with the black glue. This created a barrier around sections that helped keep the watercolors in their section. After the glue dried, we created patterns with the oil pastels. Once we were pleased with our patterns, we pulled out the watercolors and painted each section. Halloween Wreath: We just used plastic Halloween trinkets we had collected over the season and glued them to a paper plate wreath we painted. 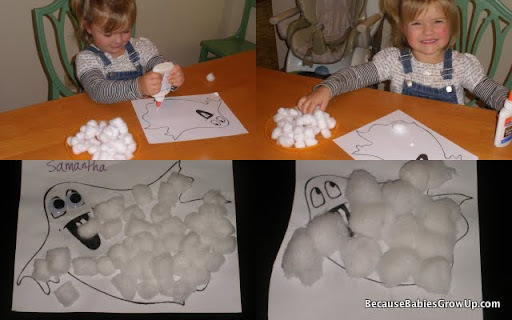 Cotton ball Ghost: I googled “ghost coloring page” and picked one I loved then printed it out. We glued cotton balls to fill it in. This is great for really little ones all the way up to 4/5 year olds. Especially when you let the squeeze the glue themselves. Excellent fine motor development! What are you or your little one dressing up as this year? We had an atypical weekend as we watched General Conference for our church. (It’s a broadcast from the leaders of the LDS church that comes in 4 2-hour sessions over two days.) By Sunday afternoon the kids were restless. We’d done puzzles and workbook pages, snuggles and snacks. We’d been spending our time downstairs watching it on TV. But for the final stretch, we took the iPad upstairs and sat at the kitchen table. The kitchen table is a gathering place in our house. It’s where we craft, snack, do homework, eat, read, listen to music, and produce art. Sammi commented one day to me, “Isn’t it funny that we eat dinner at the craft table?” Creative expression is a huge element of our kids’ days. They are happier and more at peace when they’ve had time to create something. So on this Sunday afternoon we brought out the big guns: the watercolor supplies. We had watercolor paper. I love the texture of watercolor paper. We had Crayola watercolor paints. They have the brightest colors and wash up the easiest of all the brands we’ve tried. Then we have a collection of brushes. The kids love big brushes. Sammi is starting to understand using different brush sizes for different details in her paintings. Finally a cup of water. And a medicine dropper. We use it to drop a little water in each color. Here’s the final products. But like always, the process was where they unwind and get back into their good moods. The end result is proof of happy memories and brings a smile to our faces! What do yo do to get your kids out of a funk? Happy Valentine’s Day. Hope it’s one filled with love and friendship for you and your little ones! Here’s a favorite song of ours. I shared it last year, as well as this awesome nesting heart project. We’ve been making Valentine’s Cards all week. We made one for a Valentine Day Card exchange (and I took ZERO pictures!) Then we made some for family members (14 in all) and then we made some for local friends that we saw yesterday at a Valentine’s Day Party. The last are my favorite and I wanted to share them with you. The idea for the card came from Big Sounds by Bari Koral . One of the versus is about acting like a dinosaur. The girls’ favorite part is when she says “Can I get a roar?” They go wild roaring as loudly as they can. On the outside of this card is a dinosaur and the words “Walk Tall.” Inside it says, “and know you are loved. (Can I get a roar? )” We cut out the dinosaur and glued it on with a glue stick. Then we drew a line around it with white glue and added glitter. Shook off the extra glitter and waited, impatiently, for the card to dry. Can I get a Roar? Have you posted pics of Valentine cards you’ve made? Please leave a link; I’d love to see them! I’ve noticed lots of people searching for Twinkle Twinkle Little Star crafts and thought today would be a perfect day to share the ones that have been a huge success at our house. We’re three kids in with one more yet to grow into these crafts and these are the Twinkle Twinkle Little Star crafts we return to again and again. Cut out 2 star shapes from heavy paper. Have little one decorate the stars: color, glitter, buttons. Glue one star on each side of a craft stick. Elli and Scott have both loved this craft as preschoolers. Create your own Twinkle Twinkle Little Star-y Night craft with your preschooler. This Twinkle Twinkle Little Star craft allows preschoolers to practice cutting and gluing skills, great for fine motor development and writing skills later on! Check out the full post: Twinkle Twinkle Little Star-y Night craft for preschoolers. Cut out various sizes of stars from heavy paper. Have little one decorate stars in different ways. Punch a hole in the top of each star. Use plastic department store-style hanger that spins and tie stars to the arms of the hanger. What are your favorite crafts that accompany Twinkle Twinkle Little Star?